There are newer versions of this map available. To see them, view all Yemen articles on PolGeoNow. After the pro-Hadi coalition's months of stop-and-go movement towards the Houthi-held port city of Hodeida, the battle has finally moved into the city itself. Meanwhile, fighting has also continued along the Saudi border. See all this and more on the newest update to PolGeoNow's Yemen territorial control map, which includes a timeline of changes and important events since our previous Yemen map report in September. Want to see before you buy? 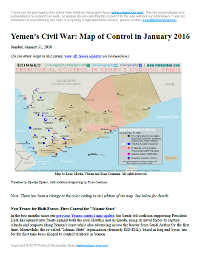 Check out our most recent FREE SAMPLE Yemen map report! Since June, anti-Houthi forces have continued chipping away at Houthi control near the port city of Hodeida and along the border with Saudi Arabia. This comes even as sharp divisions remain in Aden between Saudi-backed Hadi loyalists and UAE-backed southern separatists, both of whom are formally members of the coalition. See all this and more on the newest update to PolGeoNow's Yemen territorial control map, which includes a timeline of changes and important events since our previous Yemen map report in June. Since April, Yemen's Saudi-led coalition has resisted increasing internal divisions to gain some ground against the rival Houthi government, as well as Al Qaeda forces in the east. Now, the coalition is making a concerted push to capture the Houthi-held city of Hodeida, Yemen's main port on the Red Sea. See all this and more on the newest update to PolGeoNow's Yemen territorial control map, which includes a timeline of changes and important events since our previous Yemen map report in April. Up-to-date map of current territorial control in Yemen, color-coded for the pro-Hadi coalition, Houthi/Saleh forces, Al Qaeda in the Arabian Peninsula (AQAP), and the so-called "Islamic State" (ISIS/ISIL). In the past three months, the civil war in Yemen has been marked by infighting within the Saudi-led coalition, while those forces have made only small progress against the Houthis and Al Qaeda. See all this and more on the newest update to PolGeoNow's Yemen territorial control map, which includes a timeline of changes and important events since our previous Yemen map report in January. This is the first edition of our newly-redesigned Yemen control map, which has been optimized to match our maps of control in Syria, Iraq, Libya, and Somalia. Map by Evan Centanni and Djordje Djukic, from base map by Koen Adams of onestopmap.com. All rights reserved. As we enter 2018, Yemen continues to be divided between two rival governments - the Saudi-backed administration of President Abdrabbuh Mansour Hadi, and the allegedly Iran-backed "Houthi" group that controls the capital - even while remote areas remain within the sphere of Al Qaeda in the Arabian Peninsula (AQAP). 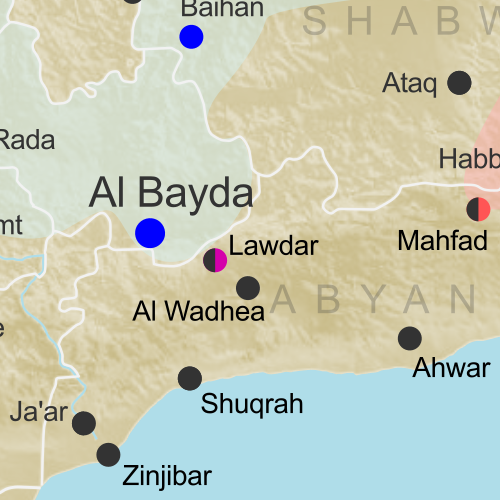 The so-called "Islamic State" (IS; formerly ISIS/ISIL) is not believed to control any towns, but is probably still present in the rural border areas between Bayda and Abyan provinces, near Lawdar. Timeline by Djordje Djukic. Map by Louis Martin-Vézian, Evan Centanni, and Djordje Djukic. In the past three months, fighting in Yemen has continued, with small changes of territorial control along the front lines between Yemen's two rival governments. Meanwhile, a US-assisted campaign against Al Qaeda in the Arabian Peninsula (AQAP) has removed some of the group's last remaining towns from its control. See all this and more on the newest update to PolGeoNow's Yemen territorial control map, which includes a timeline of changes and important events since our previous Yemen map report in late February. Since February, the Saudi-backed coalition supporting Yemen's internationally-recognized government has made some modest territorial gains against the Houthi government in two different areas, while Al Qaeda fighters still hold much of the country's east. Since the beginning of 2017, forces loyal to the Yemen's Saudi-backed President Hadi have gained ground against the Houthi government along the Red Sea coast, while fighters of Al Qaeda in the Arabian Peninsula (AQAP) have once again taken over parts of southern Yemen's Abyan province. See all this and more on the newest update to PolGeoNow's Yemen territorial control map, which includes a timeline of changes and important events since our previous Yemen map report in late December. This is part of a series of Yemen maps and infographics created in collaboration between PolGeoNow and CIGeography. Click to enlarge. Map by Louis Martin-Vézian, Evan Centanni, and Djordje Djukic. All rights reserved. In the past three months since our previous Yemen control map report, fighting has continued between Houthi rebels and forces loyal to the Saudi-backed government of President Hadi, with small changes to territorial control on the eastern and northern fringes of Houthi territory, including along Yemen's border with Saudi Arabia. 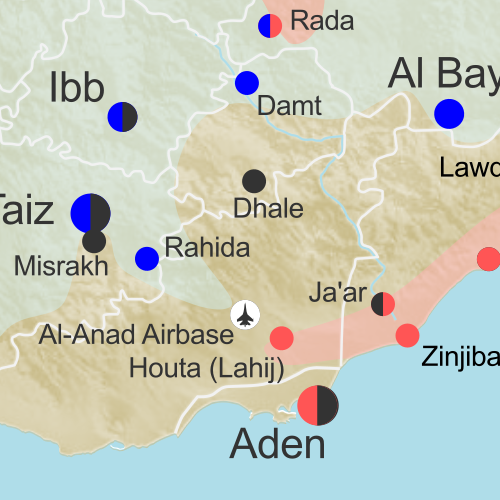 Meanwhile, Al Qaeda in the Arabian Peninsula (AQAP) has remained entrenched in parts of the east, while allegedly capturing an area near its one-time stronghold of Rada in the country's west. Since our last Yemen control map update almost two months ago, Al Qaeda has lost a large part of its territory in Yemen, even as fighting continues between the Houthis and the Saudi-backed Hadi government. See all this and more on the newest update to PolGeoNow's Yemen territorial control map, which includes a timeline of changes and important events since our previous Yemen map report in early August. In the three months since our previous Yemen map update, Houthi and pro-Hadi forces have continued to trade blows in the south and east, as well as along the border with Saudi Arabia. Meanwhile, Al Qaeda and the so-called "Islamic State" (ISIS/ISIL) have launched attacks in southern cities. See all this and more on the newest update to PolGeoNow's Yemen territorial control map, which includes a timeline of changes and important events since our previous Yemen map report in February. In the months since our previous Yemen control map report, Al Qaeda has lost some of its most important territory in Yemen, including a major city it's held for the past year. Fighting has also continued between the Hadi government and the Houthi alliance, despite attempts at a ceasefire. This map and report are exclusive premium content, available to paid subscribers or for individual purchase. Download PDF (US$14.99) New discounted price! Not a member yet? Learn more about our professional subscription service! Though it's been less than three weeks since our last Yemen control map update, there have already been several changes to territorial control. 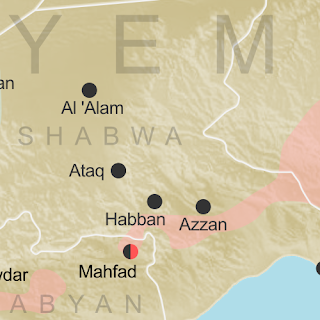 Most notably, Al Qaeda in the Arabian Peninsula (AQAP) has rapidly expanded its territory, recapturing most of the towns it held from 2011 to 2012. Meanwhile, the Saudi-led coalition supporting President Hadi has also made progress against the Houthi rebels over the past weeks. See all this and more on the newest update to PolGeoNow's Yemen territorial control map, which includes a timeline of changes and important events since our previous Yemen map report at the end of January. Up-to-date map of current territorial control in Yemen, color-coded for the pro-Hadi coalition, Houthi/Saleh forces, Al Qaeda in the Arabian Peninsula (AQAP), and "Islamic State" (ISIS/ISIL). 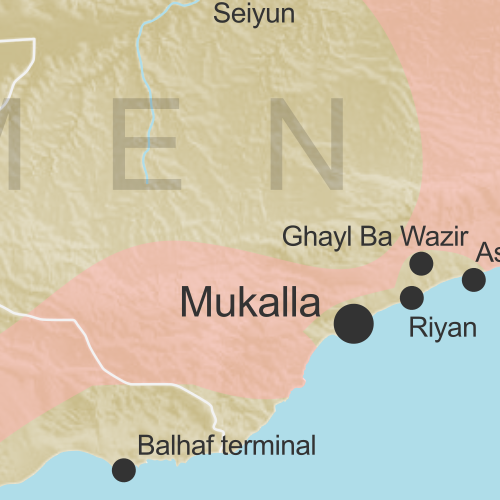 In the two months since our previous Yemen control map update, the Saudi-led coalition supporting President Hadi has opened new fronts against both the rival Houthis and Al Qaeda, using its naval forces to capture islands and seaports along Yemen's coast while also advancing across the border from Saudi Arabia for the first time. Meanwhile, the so-called "Islamic State" organization (formerly ISIS/ISIL), based in Iraq and Syria, has for the first time been alleged to control territory in Yemen. See all this and more on the newest update to PolGeoNow's Yemen territorial control map, which includes a timeline of changes and important events since our previous Yemen map report in November. Over the past month and a half, all sides in Yemen's civil war have achieved territorial gains. The international coalition backing President Hadi - now including troops from Sudan, as well as Saudi Arabia, the UAE, and Qatar - has made gains against the Houthis, even as the Houthis have recaptured other areas. Meanwhile, Al Qaeda has taken advantage of the chaos to continue continued its gradual expansion of power. 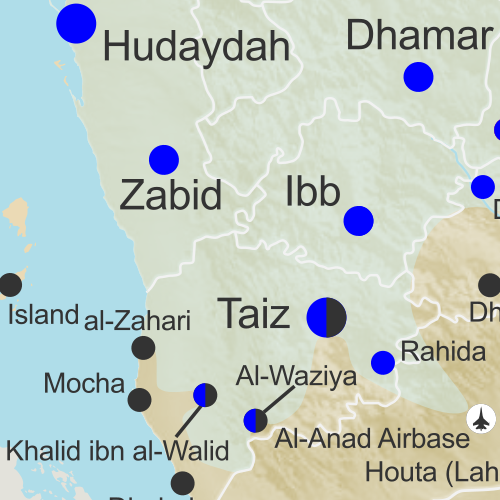 Up-to-date map of current territorial control in Yemen, color-coded for the pro-Hadi coalition, Houthi/Saleh forces, and Al Qaeda in the Arabian Peninsula (AQAP). Forces loyal to Yemen's exiled President Hadi, backed by troops from Saudi Arabia, the UAE, and now Qatar, have advanced rapidly against the Houthi rebels over the summer. 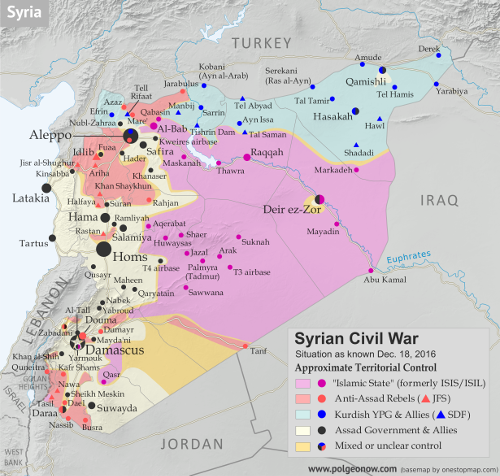 However, with the offensive now losing momentum, battle lines are solidifying and groups such as Al Qaeda are moving to fill in the power vacuum left in the coalition's wake. See all this and more on the newest update to PolGeoNow's Yemen territorial control map, which includes a timeline of changes and important events since our previous Yemen map report in August. This map and report are exclusive premium content, available to paid subscribers or for individual purchase. Yemen's Houthi revolutionary government, despite support from Iran, is rapidly losing ground against the fighters aligned to President Hadi, and supporting forces from Saudi Arabia and the United Arab Emirates. A long list of towns have changed hands just within the last two weeks, and Al Qaeda is on the move as well. See all this and more on the newest update to PolGeoNow's Yemen territorial control map, which includes a timeline of changes since our previous Yemen map report in July. Up-to-date map of current territorial control in Yemen, color-coded for the Hadi coalition, Houthi/Saleh forces, and Al Qaeda in the Arabian Peninsula (AQAP). In the past month, Yemen's Saudi-backed resistance forces have finally begun making inroads against the Houthis, capturing a major southern city while also extending their control to the northern border with Saudi Arabia. See all this and more on the newest update to PolGeoNow's Yemen territorial control map, which includes a timeline of changes since our previous Yemen map report in June. 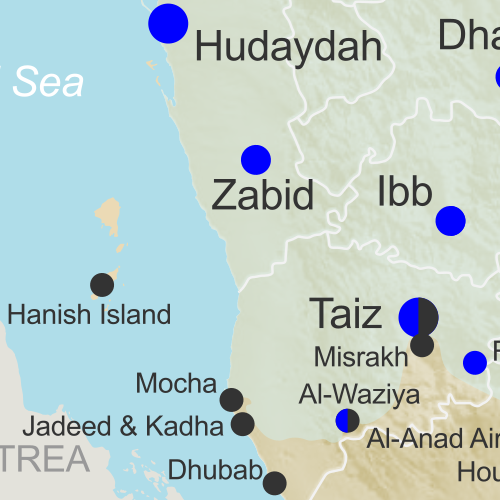 Up-to-date map of current territorial control in Yemen, color-coded for the Hadi government, Houthi/Saleh forces, and Al Qaeda in the Arabian Peninsula (AQAP).